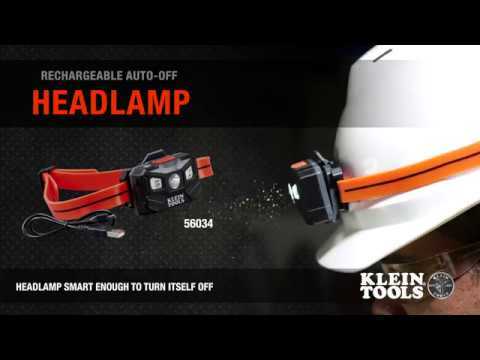 Klein Tools’ new durable headlamp gives you bright, all-day light on either the bright spot setting or the lower, wide-casting flood light setting. Removing this headlamp for recharging is easy, just slide the lamp out of the bracket on the silicone strap -- no need to remove the strap from your hard hat. You’ll know when it’s time to recharge the lamp, because the LED lights on the battery gauge clearly indicate how much battery you have left. This headlamp also features new auto-sensing technology that turns off the unit after three minutes in bright light saving battery, and a little embarrassment. Spot/High: 12 hrs. ; Flood/Low: 22 hrs.